In this quickstart, you'll add Azure Information Protection to the Azure portal, confirm the protection service is activated, create default labels if you don't already have labels, and view the policy settings for Azure Information Protection. You can finish this quickstart in less than 10 minutes. Azure Information Protection isn't automatically available in the Azure portal. You must add it. Sign in to the Azure portal by using the global admin account for your tenant. From the results list, select Azure Information Protection. Then on the Azure Information Protection blade, click Create. The protection service is now automatically activated for new customers, but it's a good idea to confirm it doesn't need manually activating. On the Azure Information Protection blade, select Manage > Protection activation. If protection isn't activated, select Activate. If you do have labels, go to the next section to view your labels. If you don't yet have labels, select that option to Generate default labels. a. Select Add or remove labels. b. From the Policy: Add or remove labels blade, select all the labels, and then select OK.
c. Back on the Policy: Global blade, select Save. Select Classifications > Labels, and spend a few minutes familiarizing yourself with the labels that are displayed on the Azure Information Protection - Labels blade. 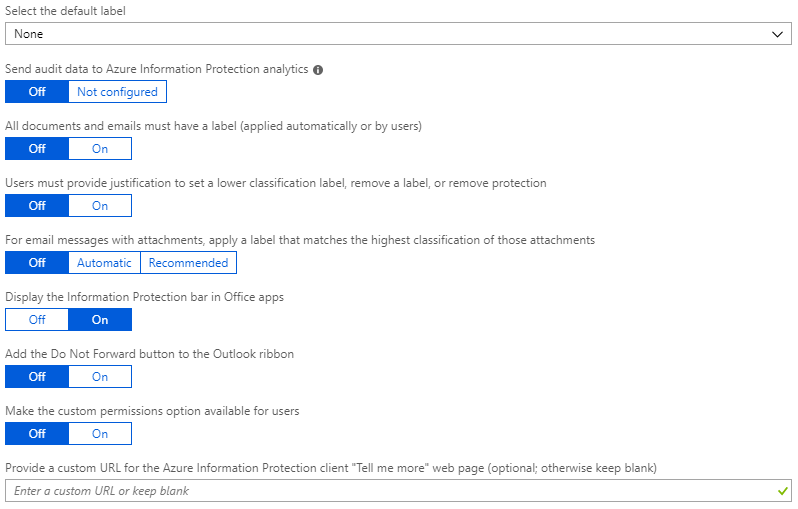 If they don't look similar to the labels in the picture from the previous section, you aren't using default labels from Azure Information Protection but labels that have been created from the Office 365 Security & Compliance Center, the Microsoft 365 Security center, or the Microsoft 365 Compliance center. Delete the custom labels and you then see the option to generate default labels in the Labels blade, as described in the previous section. The default labels for classification are Personal, Public, General, Confidential, and Highly Confidential. The last two labels expand to show sublabels, which provide examples of how a classification can have subcategories. From the MARKING and PROTECTION columns, you can see that some labels have visual markings configured. The visual markers are a footer, header, and watermark. Some labels might also have protection set. If you select a label, you see details for that label configuration on a new blade. The first time you connect to the Azure Information Protection service by using the Azure portal, default policy settings are always created for you that are used by the Azure Information Protection client. For this client, policy settings and the labels we viewed are downloaded to the client in the Azure Information Protection policy. If you are using the Azure Information Protection unified labeling client, this client does not use these policy settings. Instead, this client downloads labels and policy settings from the Office 365 Compliance & Security Center, the Microsoft 365 Compliance center, or the Microsoft 365 Security center. Select Classifications > Policies > Global to display the default Azure Information Protection policy settings that are created for your tenant. Because you are only viewing the settings, you can close any blades in the portal that you have opened. Now that you've seen the default labels and policy settings in the Azure portal, you might find the following tutorial helpful as your next step: Edit the policy and create a new label for Azure Information Protection. Alternatively, for detailed instructions for configuring all aspects of the Azure Information Protection policy, see Configuring the Azure Information Protection policy.